Venice to Ljubljana by train, not bus... No reservation needed, it's turn up & go with unlimited availability. Great scenery - bring a picnic & beer if you like! I'm delighted to report that train service between Trieste & Ljubljana was restored from 9 September 2018 with two direct trains each way per day. 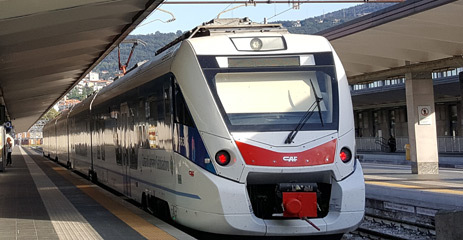 This is now the best way to travel between Venice or Trieste and Ljubljana with connections to/from Zagreb, see option 1 below. It's cheap, comfortable, no prior reservation is necessary, it can't sell out, just turn up & go. Much better than a cramped bus, the train has air-con, wheelchair-accessible toilets, plenty of luggage space, bicycle spaces, and power sockets at seats, And there are sights to see along the way. Option 2 is a variation on the direct route, using the historic tram between Trieste and the Slovenian border at Villa Opicina, with 5 or 6 departures per day - the tram is an experience in itself, but unfortunately it has been temporarily replaced by a bus since an incident in August 2016 and has yet to resume. A new twice-daily regional train started running between Trieste & Ljubljana from 9 September 2018, restoring rail travel between Italy and Slovenia after a gap of several years. It's now the comfortable and civilised way between Venice, Trieste, Ljubljana and Zagreb. You can check these times using www.bahn.de/en. * = Overnight stop required in Ljubljana when going to or from Zagreb. Other trains available between Ljubljana & Zagreb, check times at www.bahn.de/en. ** = A later early-evening connection is available from Ljubljana to Zagreb if you fancy a stopover in Ljubljana, check times at www.bahn.de/en. *** = An earlier connection is available from Zagreb to Ljubljana if you fancy a stopover in Ljubljana, check times at www.bahn.de/en. Why not stop off in Trieste? 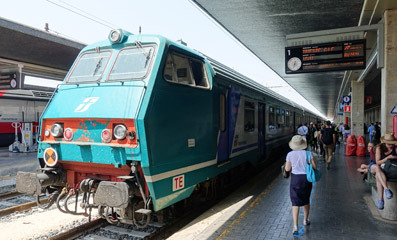 The timetable above merely shows the most suitable Venice-Trieste connection into or out of the twice-per-day Trieste-Ljubljana trains, but Venice-Trieste regional trains in fact run every hour through the day. So by all means take an earlier train from Venice to Trieste when travelling eastbound or a later one from Trieste to Venice when travelling westbound to give yourself some time in Trieste, a great city that's well worth a stopover. 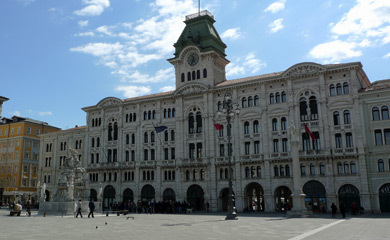 Indeed, along with Turin I'd say Trieste was one of Italy's most under-rated cities. You can check train times at www.loco2.com. Similarly, there are a number of Ljubljana-Zagreb trains every day, the timetable above just shows the suggested connection. Check times at www.bahn.de/en and by all means stop off in Ljubljana as long as you like. Venice to Trieste costs €13.40. Fixed price, unlimited availability, any day, any date, cannot sell out. Trieste to Ljubljana costs €8. Fixed price, unlimited availability, any day, any date, cannot sell out. Ljubljana to Zagreb costs around €18 full-price, but you may find a €9 promotional offer available. Buy tickets at the station on the day, no reservation necessary, tickets cannot sell out. It's that simple! If you're going to or from Zagreb, buy your Zagreb-Ljubljana ticket separately at Zagreb or Ljubljana station. Click for larger map. Green = scenic routes. Reproduced from the European Rail Map with kind permission of the European Rail Timetable people - I recommend buying a copy of the European Rail Map for your travels, www.europeanrailtimetable.eu with shipping worldwide. More details. 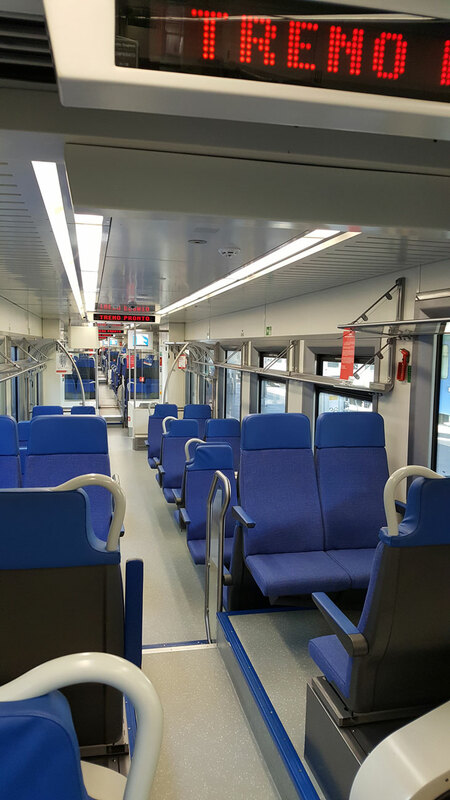 The Trieste-Ljubljana trains are operated by air-conditioned 5-car ETR 563 trains built 2012-2014, with 272 seats, accessible toilets, plenty of luggage space, 30 bicycle spaces, large picture windows, the window seats have fold-out tables with power sockets for laptops & mobiles underneath, and there's security CCTV. 2nd class only, there's no 1st class. There are no seat reservations, you get on and sit wherever you like. See a ETR563 video here. 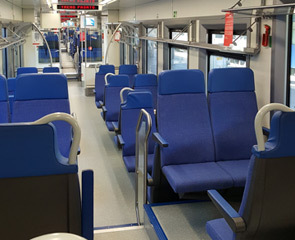 Inside the ETR563. Larger photo. The train to Ljubljana about to leave Trieste. Courtesy of Marc Williams. These trains take the classic international route once used by the famous Simplon Orient Express between Paris & Istanbul. Trains cannot climb the steep escarpment between Trieste & Villa Opicina (on the Slovenian border) like buses and the historic tram do, so after leaving Trieste Centrale the train runs a fair way west along the coast before making a giant U-turn inland and climbing steadily towards Villa Opicina. You can see on the route map above just how far out of Trieste the train has to go before turning right onto the line to Villa Opicina. Just after making that U-turn inland, the train passes non-stop through the now-closed station of Prosecco - yes that's right, the village where prosecco wine originated, although the village itself lies a little way from the station between the railway and the sea. Have your camera ready as the station building dating from 1857 will be on the right hand side going towards Ljubljana, or the left hand side going towards Trieste - as far as I know the station name-board is still displayed, though dilapidated as Prosecco station has been closed since December 2011 when passenger service was discontinued. After Villa Opicina the train crosses into Slovenia, the Slovenian side of the border is Sezana. From here the train wends its way through lovely green hills towards Ljubljana. If you manage to snap a decent photo of Prosecco station, please let me know! Approaching Borovnica, just south of Ljubljana the train enters a lovely rural valley, does a 180 degree turn at the far end and heads back out on the other side of the valley, calling at Borovnica station in the process. I assumed the railway builders hadn't the funds for a viaduct across the valley mouth, but I was wrong. The builders of what was then the Vienna-Trieste Southern Austrian Railway completed a magnificent double-arched masonry viaduct across the valley in 1856. The viaduct was the scene for high drama on 28 June 1942, when Yugoslav partisans attacked an Italian train carrying arrestees to concentration camps, freeing 300 prisoners. However, those that refused to join the partisans were executed, see the Wikipedia entry for Borovnica here. The viaduct had reached a poor state of repair by World War 2, and the after the Italians withdrew the Germans constructed a diversionary route around this vulnerable link. The viaduct was attacked and partially destroyed by the USAF 489 Bombardment Group in 1944 and never rebuilt, the railway was diverted around the valley in 1947 where it still runs today. The remaining structure was dismantled by 1950, leaving just one pier still standing today as a monument in the centre of the valley. You can see this pier from the train if you know what to look for and where to look. See Wikipedia entry for Borovnica Viaduct. See Google Map showing site of remaining Borovnica viaduct pier, and the loop of the current railway around Borovnica valley through Borovnica station. The views over the valley will be on the left hand side of the train going north towards Ljubljana, or the right hand side travelling south towards Trieste. If you get any photos, please let me know! You arrive at Ljubljana's large central station, walking distance from the city centre. Built in 1848 and renovated in 1980, the Irish Author James Joyce once spent a chilly night sleeping at the station in October 1904 on his way to Trieste -there's a small plaque to mark this event. 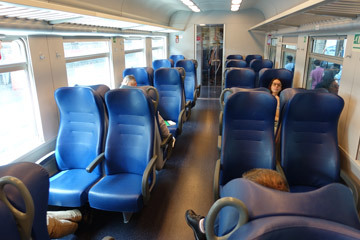 The hourly regional train from Venice to Trieste. No reservation necessary, turn up & go! You sit where you like. 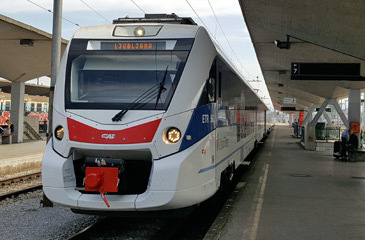 The air-conditioned electric train from Trieste to Ljubljana train, about to leave Trieste Centrale. Courtesy Marc Williams. This is essentially the same route as option 1, but instead of taking a train all the way from Trieste to Ljubljana, you use the historic Trieste tram (if operating) for the 6km (3.5 miles) between Trieste and the Italian/Slovenian border at Villa Opicina, picking up the train to Ljubljana there. The tram line isn't marked on the route map above but you can easily imagine it as a fairly direct line from Trieste to Villa Opicina (so a much shorter distance than that taken by the train, which cannot scale the escarpment behind the city). You don't get to pass through Prosecco station like you do on the train, but the tram is an experience in itself. It's the only tram in the world that becomes a funicular half way through its journey to climb the steep escarpment out of Trieste to the plateau above the city, with great views over the city and the Adriatic, have your camera ready! You get up to 6 departures a day this way rather than just two, as there are more trains between Villa Opicina & Ljubljana, in addition to the ones that extend to/from Trieste. The historic tram between Trieste & Villa Opicina had a prang on 16 August 2016 and has been out of action for repairs ever since. It was due to resume in April 2017 then June then August, then in April 2018. But still no tram, and some sources say it may not resume until 2020. You can still travel this route, as a replacement local bus service is operating every 20-30 minutes for the same price, although now the direct trains are operating there's little point if the historic tram is still out. 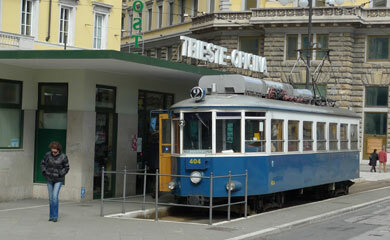 Do let me know if you find the tram back in service (as there's no easy way to check without going to Trieste. 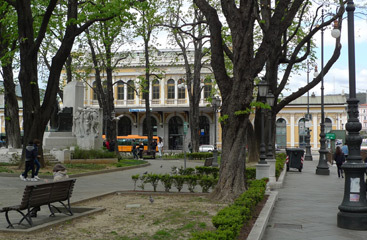 Bus number 2 runs every 20-30 minutes between Trieste Piazza Oberdan tram terminus and Villa Opicina tram terminus (a short walk from Villa Opicina railway station). Bus number 4 runs every 20-30 minutes between Trieste Piazza Oberdan tram terminus and Villa Opicina station, saving a walk. 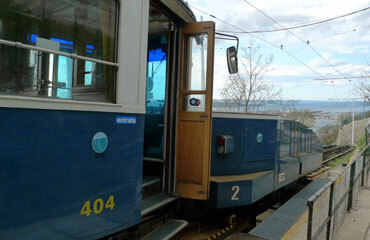 Step 1, travel from Venice Santa Lucia to Trieste by regional train, these run every hour through the day taking 2h05. The fare is €13.40, buy at the station on the day, no reservation necessary or even possible, you simply buy a ticket at the station and hop on. You can check train times and prices at www.trenitalia.com. Map of Trieste. Note that some Trieste-Venice trains take a longer 3h route and cost more, €17, ideally you want the hourly direct 2h05 train. Step 2, now take the wonderful historic tram from Trieste to Villa Opicina on the Italian side of the Slovenian border (6km, 3.5 miles) or if the tram is still out of service, the replacement bus service. The tram runs from Trieste Piazza Oberdan tram terminus to Villa Opicina tram terminus, every 20 minutes 07:00-20:00, journey time 25 minutes, fare €1.35. The tram is an old-fashioned piece of Trieste heritage, and unique in that for 10 minutes of the journey it buffers up to a 'drogue' and becomes a funicular railway up the steep escarpment out of Trieste. The tram website is www.tramdeopcina.it. On arrival in Villa Opicina it's a 10-15 minute walk from the tram terminus to the mainline rail station, see map with walking directions. Step 3, take a regional train from Villa Opicina to Ljubljana. These run around 6 times per day, typical journey time 1h57, fare around €8.70, you can check times at www.bahn.de or www.slo-zeleznice.si. No reservation is necessary or possible, just hop on and pay on board. The journey is relaxing and very scenic as the train wends its way through the hills past pretty villages, and finally down into the plain to Ljubljana. The route passes Borovnica, see the section about Borovnica valley and viaduct in option 1 above. Step 4, if heading to Zagreb: Trains link Ljubljana with Zagreb several times every day, journey time 2h28, fare around €18 although promotional fares start at €9. just buy a ticket at the station. It's a lovely scenic journey through the hills along the River Sava. You can check times at www.bahn.de but ignore the departures marked 'BUS' as these are long-distance buses, not trains. Step 0, if starting from Zagreb: Trains link Zagreb with Ljubljana several times every day, journey time 2h28, fare around €18 although promotional fares start at €9. just buy a ticket at the station. It's a lovely scenic journey through the hills along the River Sava. You can check times at www.bahn.de but ignore the departures marked 'BUS' as these are long-distance buses, not trains. Step 1, travel from Ljubljana to Villa Opicina (the Italian border town) by local train. These run up to 6 times per day, journey time around 1h55, fare around €8.70. No reservation necessary, just hop on and pay on board. The journey is relaxing and very scenic as the train first crosses the plain, then wends its way up into the hills past pretty villages. At one point it enters, circumnavigates then leaves a long green valley, climbing for height all the while. Lovely! Step 2, transfer the 6km (3.7 miles) from Villa Opicina to Trieste using the wonderful historic tram, or if still out of service, the replacement bus service. The tram terminus is just a 10-15 minute walk from Villa Opicina rail station, see map with walking directions. 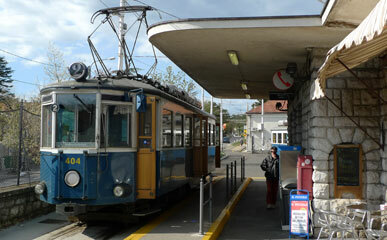 The tram runs every 20 minutes 07:00-20:00, journey time 25 minutes, fare €1.35. The tram is an old-fashioned piece of Trieste heritage, unique in that for 10 minutes of the journey it buffers up to a 'drogue' and becomes a funicular railway down the steep escarpment into Trieste. Leaving the drogue behind, it then runs a few hundred yards more to the Trieste Piazza Oberdan tram terminus, which is only 3 minutes walk from Trieste Centrale station (walk back a few yards along the tram tracks, then turn left). Map of Trieste. The tram website is www.tramdeopcina.it. Step 3, travel from Trieste to Venice by hourly regional train. These run every hour, journey time 2h05, fare €13.40. Fare €12.10, no reservation necessary. 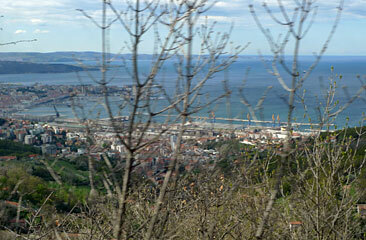 But I'd recommend having a longer look round Trieste as it's a lovely city, and taking a later train. You can check train times and prices at www.trenitalia.com. No reservation is necessary or possible for regional trains, you buy a ticket at the station and hop on. Note that some Trieste-Venice trains take a longer 3h route and cost more, €17, ideally you want the hourly direct 2h05 train. What's the tram ride like? Above left, for the ascent of the escarpment the tram couples up to a 'drogue', the only tram in the world to transform into a funicular railway for part of the ride. Above right, the tram terminus and cafe at Villa Opicina, the Italian border town next to Slovenia. Slovenian local train from Villa Opicina to Ljubljana. 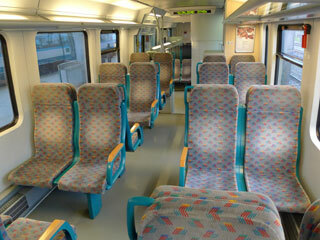 These trains are modern & air-conditioned with on-board information displays, toilets & ample room for luggage. Take provisions with you, as there's no catering at Villa Opicina station or on the train. 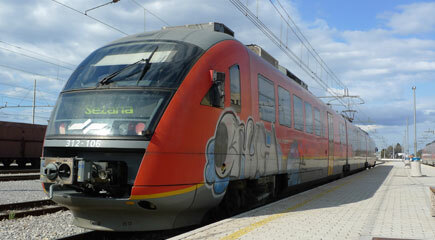 These trains run up to 6 times a day from Villa Opicina on the Italian side of the border to Ljubljana. You can check train times at the Slovenian Railways website www.slo-zeleznice.si.